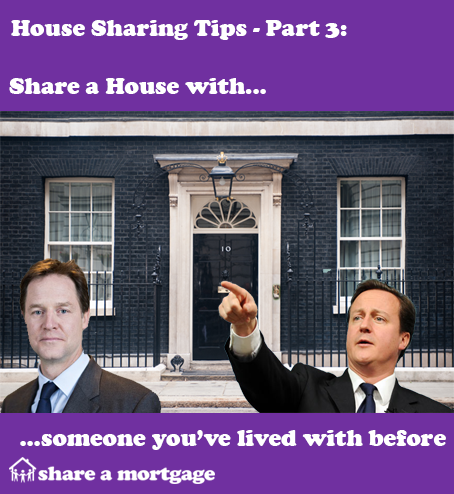 House Sharing Tips Part 3: house sharing with someone you have lived with before is for for many the most obvious choice. In fact some analysts are suggesting this will be the most likely decision for David Cameron, if the Conservatives don't get a majority vote, is to continue their house sharing coalition with Nick Clegg and the Liberal Democrats. The phrase ' better the devil you know' certainly fits here where both parties will know exactly how to work with each other and understand how best to make the relationship work. House sharing can feel the same, especially if you have lived with someone for such a long time and really know them. You've gotten to know each other's living habits and lifestyles, that living together is simple and reassuring. This is why many flat sharers like to share buying a home together as their first stepping stone into home ownership. After sharing a flat with someone you'll have found out whether you can handle living with them. In fact, it is a great way to get to really know someone. If you are currently sharing a flat with someone maybe you should start talking about the idea of sharing buying a place together. Seen more as an investment to get onto the property ladder with a view to selling in a few years and then hopefully being able to afford a place on their own or with a partner. If you don't have a flat mate to share a house with then you can look to your partner, members of your family, friends, or you can join Share a Mortgage - our platform is devoted to helping you find someone who is a good match for you.